My first memory of Elvis is not a song. It’s an image of a him wearing a jumpsuit on stage with his band in the 70s, looking a bit sweaty and performing songs that had become so woven into pop culture that they blended into the background. I did not understand why the grown-ups gave him so much credit. After seeing Donny Osmond sing “Are You Lonesome Tonight” on The Donny & Marie Show, I added one track to the Elvis log in my brain. Eventually songs like “Hound Dog,” “Blue Suede Shoes” and “Jailhouse Rock” joined the list. “In the Ghetto” was kind of interesting, because it seemed socially conscious. But, to me, nothing stood out as any reason for this guy to be any different from the one who sang the theme song to Happy Days. As a music fan, I have a basic understanding of the role Elvis played in the emergence of rock music in popular culture. I know a handful of people my age who actually do consider him “The King.” I know that many of the 60s artists that I admire were big fans of Elvis and that meeting him was a highlight of many of their careers. But his music had never elicited more than a shrug from me. It wasn’t until I caught a few moments of a PBS show on Elvis’ gospel roots that I got it, at least on some level. 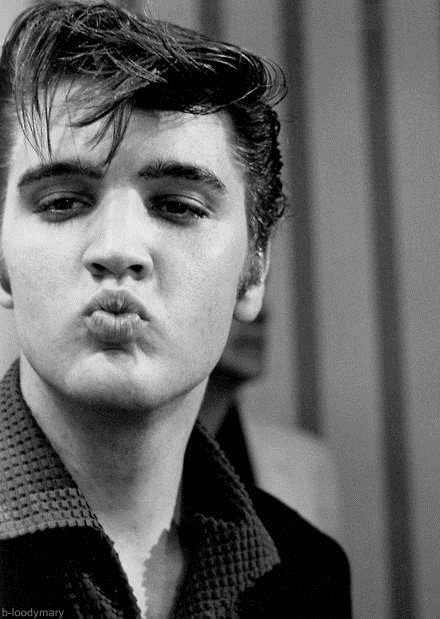 Elvis wasn’t really about “Suspicious Minds” and “Love Me Tender”. He was about the energy he brought to the music… the sense that before the words passed through his mouth they started the trip deep in his soul. My husband recently said that what makes a singer good is their commitment to the lyrics. This is where it all clicked for me with Elvis. This past weekend, my husband and I were sitting on our front porch listening to music on YouTube. This is where we go when we want something different from the thousands of songs in our iTunes account. I’ve been on a 70s light rock kick for about a year now, so I was playing things like Pablo Cruise and Hamilton, Joe Frank & Reynolds, and he asked to hear some Elvis (which, of course, is where he’d want to go after “Don’t Pull Your Love“). I avoided the typical and found some gems from early in his career. There are other artists out there who are known for work that doesn’t capture their true essence, unfortunately. Consider Heart and “Alone” vs. “Magic Man.” God forbid they are remembered for their 80s hits over their contributions in the 70s, but I have a feeling it happens. Some would call it selling out, but I think it’s more complicated than that. “Heartbreak Hotel” might sound trite to people who’ve heard it 100 times over the grocery store sound system (let alone the dozens of other places it’s played), but the swing of his cadence and deep reach of his voice probably sounded amazing to the people who first heard it.